Chicago river tours are great! Chicago river tours are a great way to take the best chicago boat tours to know the shoreline is as beautiful as we know it is. While we do offer in our opinion the best boat tours, we know that Chicago river tours only lets you see a portion of Chicago, which is why our Chicago bus tours and Chicago river tours are the best combo you will find. How do we do Chicago bus tours and Chicago river tours? We teamed up with the best boat tour provider in Chicago, so we provide you with Chicago bus tours and then take you to the meetup spot, so you can see the rest of Chicago on the river. This is a wonderful tour combination that you will love. We provide you with a great bus tour experience stopping at a few places for pictures, which we list on our Chicago tour map. 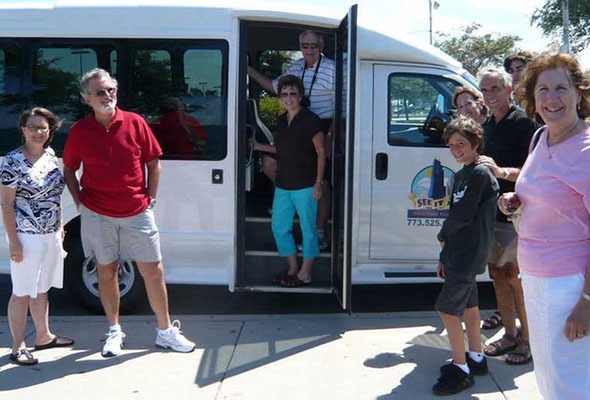 Our goal is to make your tour a great time, which is what the people in the above picture who went on one of our tours had. Chicago bus tours package the best boat tour while on a Chicago river tour with what we believe to be the best bus tours, to make a great and truly unique way to experience Chicago that very few experience. You truly get both of best worlds. 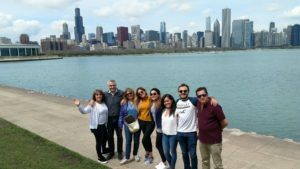 Our Chicago river tour provider is known for their great river tours and we are known for our great chicago bus tours, making the bus and river combo the best solution you could find.